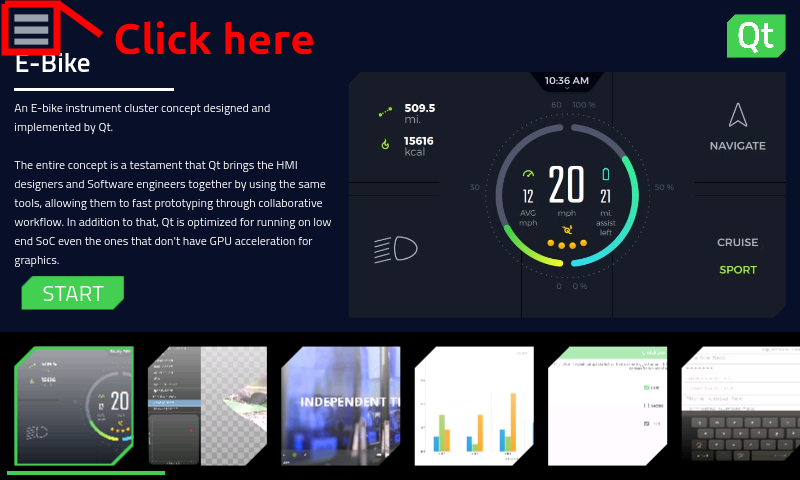 This Partner Demo Image comes with a wide range of preinstalled Qt Demos, so you can get a first idea of the performance of the device with Qt. 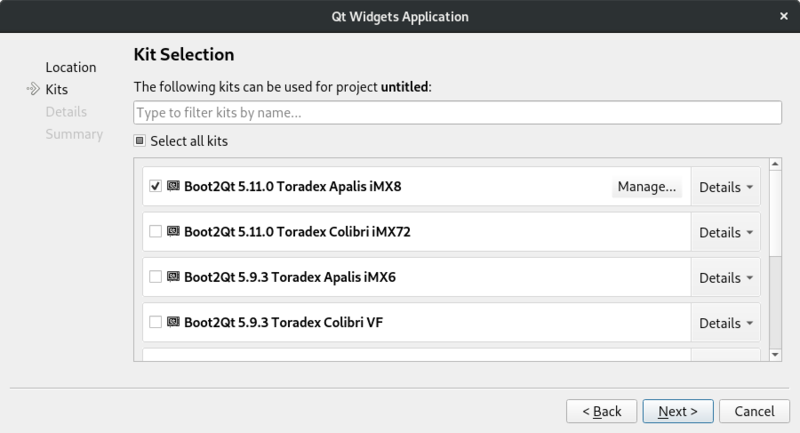 It is also pre-configured so you can directly build and deploy other Qt demos and your own applications to the Toradex Module seamlessly. 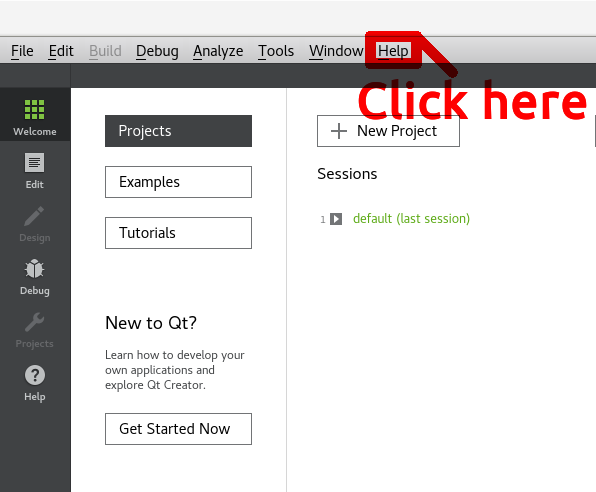 To get started sign-in for a free evaluation version of the Qt IDE. Please see also our joint-webinar with The Qt Company. The Qt framework is one of the most popular Graphical User Interface (GUI) frameworks used in Toradex Modules. Please refer to the Qt Documentation for a comprehensive knowledge base documentation. 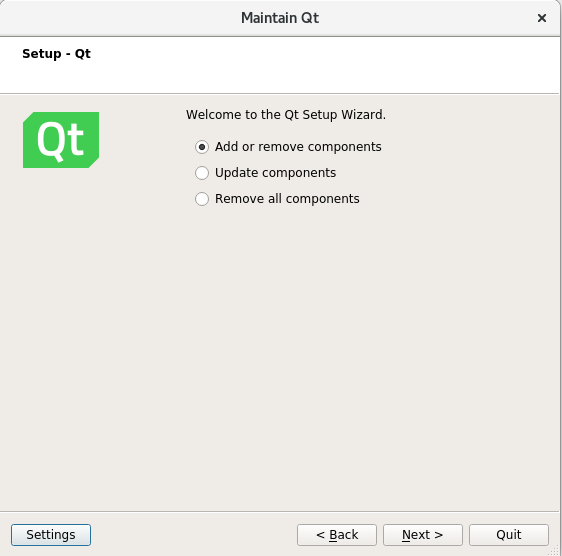 This section provides instructions for you to quickly get started with Qt for Device Creation. Note: The Qt Company provides a guide for Toradex supported modules. Please refer to the Qt Toradex Apalis iMX6 Guide for additional reference. Note: The Qt Company provides a guide for Toradex supported modules. Please refer to the Qt Toradex Colibri iMX6/iMX6ULL and iMX7 Guide for additional reference. Qt for Device Creation is a commercial offering from the Qt Company. 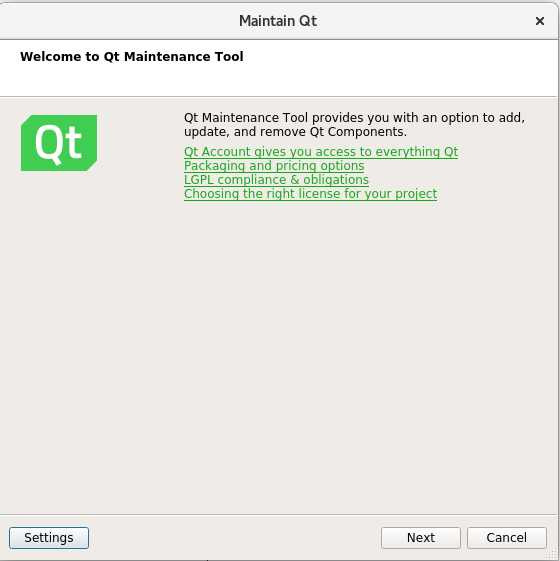 Download the free evaluation version of Qt for Device Creation Development Tools. 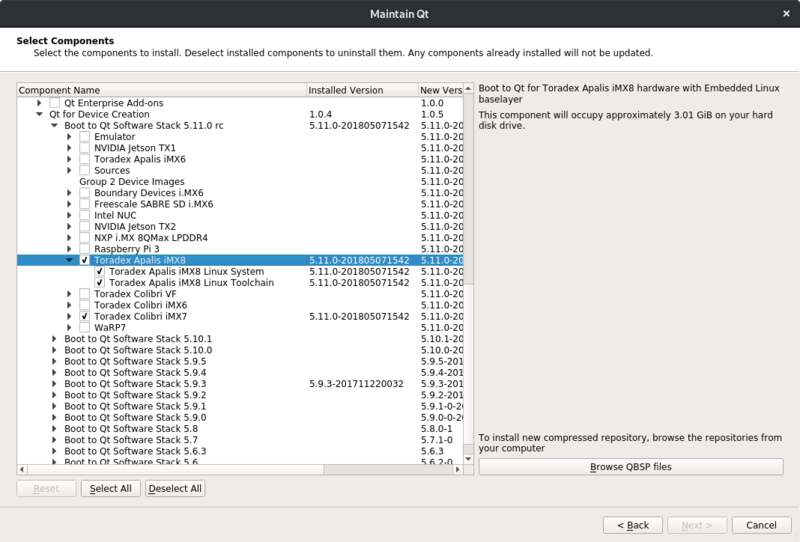 If you already have a license, download the Qt installer. Start the installer and login with your account. In the component selection dialog under Qt for Device Creation -> Boot to Qt Software Stack, make sure to select the corresponding Toradex module. Qt Maintenance Tool's wizard will appear. Press "Next". Pick "Add or remove components" option. Press "Next". Note: Also make sure to install the Qt Creator and the Boot to Qt Flashing Wizard. Qt Creator can be used to create Qt applications for Toradex modules and the applications can be directly deployed either over network or USB. When creating a new project, make sure to select the correct kit e.g. 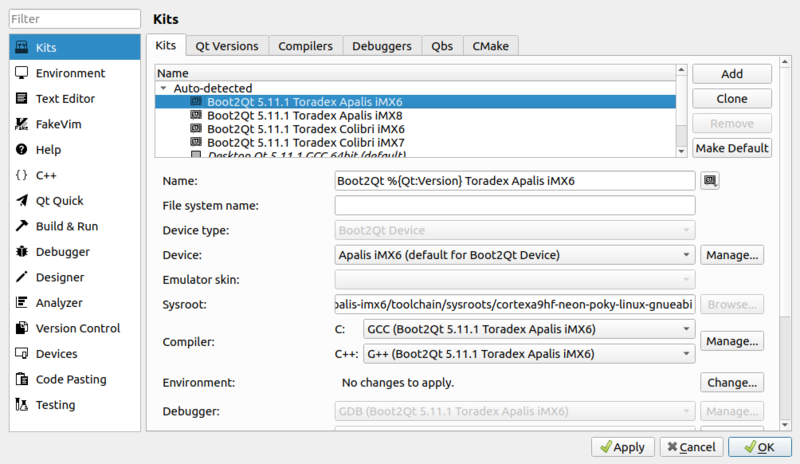 "Boot2Qt 5.11.0 Toradex Apalis iMX6" in the kit selection. To setup a device, in the Qt Creator IDE go to Tools -> Options -> Devices and add a Boot2Qt device with the previously found IP. Warning: Instructions in this documentation assume Ubuntu Linux 64-bit 16.04 LTS or later. Other Linux distributions may work, but have not been tested. Connect your device to the development host via USB cable. If the device is already connected, disconnect and reconnect the USB cable after running the command above. 2 - Connectors X49 and X50 are shared in Apalis Evaluation Board. QtCreator will automatically setup networking over the USB link and the device will appear in the QtCreator's Devices list without need to manually add it. No extra action is required, the device is recognized by the IDE seamlessly. For more information about how to develop a Qt Application head over to the extensive Qt documentation. 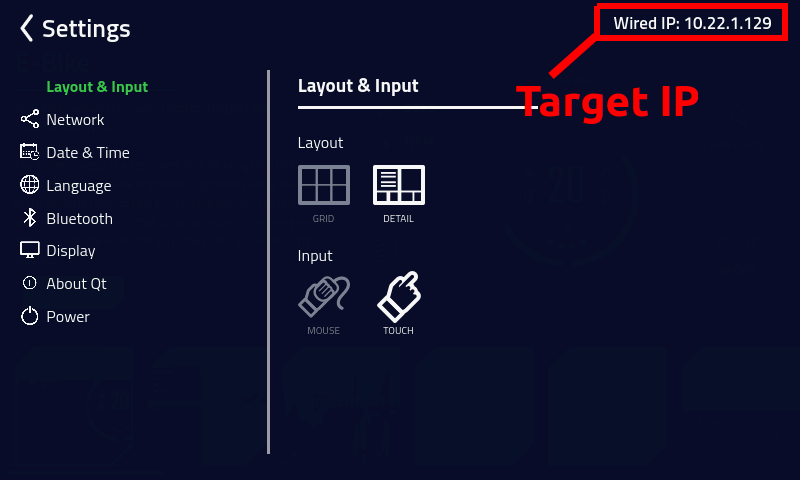 Note: Qt uses libinput as the default touch screen input library. Therefore, for calibration please see the libinput section of the article referred to in the table above. Qt is a large framework with different licenses. Licenses also depend on which Qt version is used. Our partner the Qt Company can help you find the right license, therefore if you have questions consult the Qt Licensing page for details. As a Toradex customer, you are entitled to have discount prices on Qt licenses. Please contact your local Toradex office for more information. 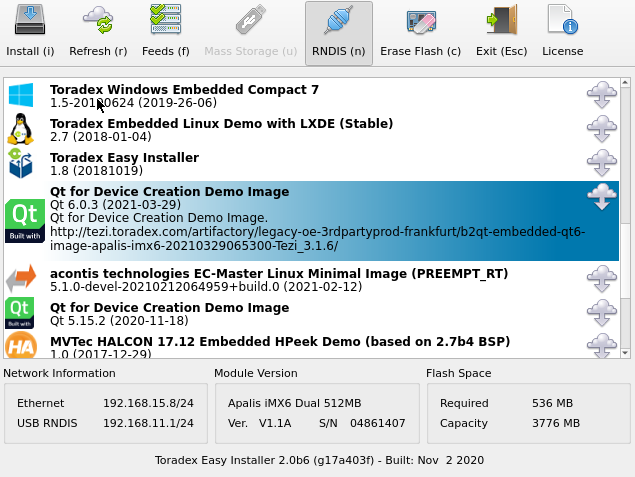 This release notes are strictly related to the test of the Qt for Device Creation images in Toradex hardware. They are not related to the Boot 2 Qt releases. Colibri modules: Touch screen does not work out-of-the-box. Colibri iMX7: Media Player demo application does not work as expected. Video playback displays a black screen. Apalis iMX6: Resistive display does not work. All modules: Resistive touch screen does not work out-of-the-box.